A. Wollam Chavako, Botello: Angel Botello Barros, Galeria Botello, Inc., San Juan, 1988, p. 80-81 (illustrated). Exhibition catalogue, Botello: Exposición Antológica, Vigo, Centro Cultural Caixavigo, 1995, no. 5, p. 23 (illustrated) & p. 52. Santo Domingo, Ateneo de Santo Domingo, 1940. We are grateful to the Galería Botello for their assistance in confirming the authenticity of this work. Spanish painter Ángel Botello Barros (1913, Cangas de Morrazo-1986, San Juan) formed part of a group of artists and intellectuals who migrated to the Americas after the Spanish Civil War. He lived in Santo Domingo, Haiti, and settled in Puerto Rico in 1944. Botello studied at the Ecole des Beaux Arts in Bordeaux, France, 1930 and in the Academia San Fernando in Madrid, 1935. During these years, he exhibited in France and in Spain; works executed at the time show the marked influence of Cézanne, in the tectonic brushstroke. Botello's mastery in the handling of color is evident in numerous land and cityscapes of this period. Fully formed as an artist, Ángel Botello Barros and other Spanish artists brought to the Americas a solid academic training and the metropolitan artistic ambience they would help to recreate in the New World. In Puerto Rico, he established the first successful art gallery, that served as model and helped train members of the 1950s Generation. 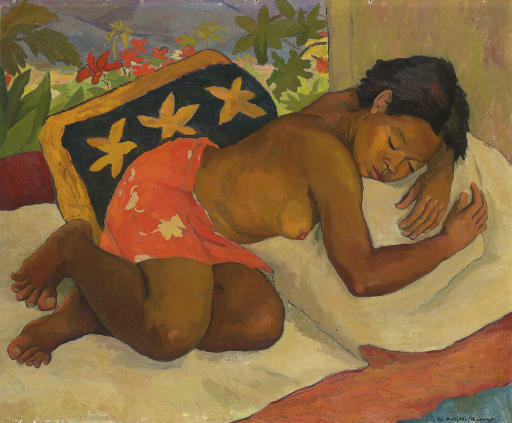 Niña durmiendo, (Sleeping Girl) was first exhibited in the Santo Domingo Ateneo in 1940, the very year of Botello's arrival in the Dominican Republic; it belongs to the first style developed by the artist in the Antilles. Contact with the tropics and the peoples of the Caribbean had a decisive influence on Botello; in this work, the colors and the composition exude an aura of paradisiacal beauty. The point of view is high, and the scene is bathed in an even light that casts no shadows. The girl is placed on the bed, as if on an altar; her sleep reinforces the distance between her world and that of the spectator. The soft curves, the roundness of the sitter's body, the combination of innocence and sensuous beauty are exceptional in the work of the artist. This and other works of the early 1940s help to explain the reference to Gauguin pointed out in reviews of Botello exhibitions. (1) Niña durmiendo, however, is an image of innocence, a long way from the menace and mystery of Gauguin nudes. The brilliant landscapes of the early 1940s share this aura of innocence, of sheer sensual delight in the depiction of the light and beauty of the tropics. But the depiction of a bountiful paradisiacal locus, peopled by sensuous, passive women, was short-lived. Botello moved on from this to portray scenes based on Haitian vodou ceremonies, in which he preferred a muted palette and geometric renderings of the figure. Niña durmiendo is a tribute to nubile beauty, a testimony of Botello's first impression of a culture that would nourish his artistic production. Marimar Benítez, Chancellor, Escuela de Artes Plásticas, San Juan. 1) Gómez Sicre, Botello, pintor de lo exótico, Havana, 23 March 1943.